Discover Napa Valley in a whole new way, with our Napa Valley Retractable Roof Open Top Sprinter tour! 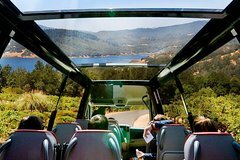 This all-day tour provides amazing views of the Napa valley area with a retractable, glass roof Mercedes Sprinter with a professional guide in a small group setting (19 people maximum). Visit to 4 different wineries and locations in the Napa area (with a picnic lunch included). Finish the tour with a ferry cruise back to San Francisco to end the day on a perfect note. The Napa Open Sprinter tour is a full, 8.5 hour tour to the Napa area. Picnic lunch is provided at one of our participating wineries and will finish with a ferry cruise at the end of day. Tastings are not included/optional and will need to be purchased directly with the wineries.